In the past year I've been working on a book, describing PHP's Date and Time functionality in great detail. 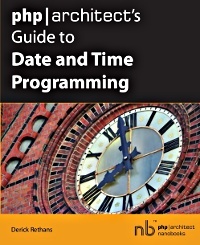 It's now finally out under the name "php|architect's Guide to Date and Time Programming". Look at the pretty cover! It's actually a picture I took some months ago from the church in Skien, where I am still living (more about that in a later post). The book is devoted on helping you understanding dates and times, as well as how PHP deals with it. It explains how PHP parsers and reads dates and times in strings including possible pitfalls; timezones, their history, the annoyances and how to deal with them properly; formatting and displaying dates and times; and last but not least, how to handle intervals and iterating over time. There is more information on the website where you can also buy this awesome book. And in case you're wondering "what? dates and times are really simple! ", then this book is definitely for you. Rumour is that all attendees of the Dutch PHP Conference will receive a copy with their tickets, if you're asking nicely I might even sign your copy! I'll be there to give a talk on "PHP on the D-BUS" and will show you how to talk to skype, GSM chips and other desktoppy things! Purchased, and read through the first half in a few days. Well worth it.